This retreat at Hinterland Village is a great opportunity to reconnect one’s body and mind whilst experiencing the magical rains of Kerala. This retreat is designed and flexible for all levels of yoga practitioners. Discover a unique program of yoga sessions/classes for all levels of practitioners. Dedicated to ‘One Reality’, ‘one consciousness’ with the universe- the truth, the Bodhi centre uses a holistic approach to purify and reconnect body, mind and the reality. Enjoy the benefits of meditation, yoga and Ayurveda, and learn how to see or experience that ’One reality’. In addition to the daily yoga classes, you will also take part in a rewarding community-based Volunteer project, Spread between morning and afternoon. The local team will help you prepare for various sessions and projects. Hinterland Village is a homestay where you can get all the warmth and care that remind you of home with the added benefits and luxuries of a resort. Each of the available rooms is different and offers a unique blend of antique charm and modern comfort. All rooms are air-conditioned and offer stunning views of the surrounding greenery. Hinterland Village offered shared room accommodation only. Massages and other therapies take place in two individual rooms each featuring a treatment table as well as a bath steamer. A beautiful and inviting yoga space was designed to maximize contact with nature. Surrounded by coconut trees, lush vegetation, and a paddy field, the open shala is the perfect setting for unforgettable yoga sessions. Start the day with pranayama and meditation sessions. Deepen your yoga practice for on a daily basis for 13 days, working on the primary series and moving onto an advanced set of postures. Learn more about asanas, anatomy, and perfect certain postures during workshops. Relax deeply and restore both your body and mind with yoga Nidra (deep relaxation). Get a consultation with the on-site Ayurvedic doctors during your stay. Analyse your body constitution and diet recommendations. The daily schedule is subject to change as per conditions. Designed for yoga lovers or beginners alike, our yoga and volunteering program will help you deepen your understanding of yoga and will help you find your true self on both a physical and spiritual level. 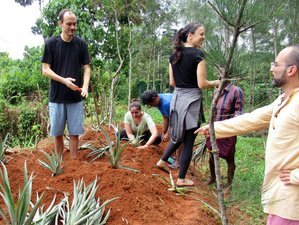 The volunteer projects in sustainable living water conservation, organic farming, dressmaking and designing, soap making, incense making, food making so you can find something that fits in with your skill sets and personal interests. Learn fundamentals of cooking Indo Western Cuisine, Vegan food, detox juice and salads. Hinterland Village represents seven acres of lush greenery; a haven of rich native biodiversity and an oasis of peace on the outskirts of the city of Kochi. Hinterland Village boasts more than 180 native species of flora that grow abundantly and naturally throughout the year. The Bodhi center at Hinterland Village was an initiative undertaken by its founder, Unni, to promote yoga and Ayurveda. Unnis desire was to create a space where guests and visitors could immerse themselves in spiritual practices in a peaceful and natural environment. The Bodhi Ayurveda and Yoga center at Hinterland Village is a spiritual paradise set amidst jungle giants overlooking a paddy field. The space around the Bodhi Ayurveda and Yoga center is a paradise for bird watching and nature walks. The resort also has a swimming pool set amongst the greens so guests can cool off from the South Indian heat. Hinterland Village takes pleasure in harmonizing with nature and guests are encouraged to do the same. Bodhi, a space that has been created amidst lush trees and the nearby paddy field, is a center for Ayurveda treatments and yoga practices that are exclusive to the guests of Hinterland Village. The price of this retreat includes daily sattvic vegetarian breakfast, lunch and dinner. Enjoy a healthy selection of balanced meals made by the resort's excellent cook. Most of the vegetables and rice are organically grown and being used in the kitchen. During this retreat, you will have a Backwater cruise. The Kerala backwaters are a chain of brackish lagoons and lakes lying parallel to the Arabian Sea coast of Kerala state in southern India. The network includes five large lakes linked by canals, both man-made, and natural (optional on extra payment). This retreat includes a consultation with an on-site Ayurvedic doctor that will administer treatments according to your body constitution. Three days massages and steam baths will be scheduled during your stay.